If you’re reading this blog, odds are you’re very familiar with the sales funnel concept for turning prospects into customers. The funnel is tried and true, and about as marketing 101 as it gets. It’s helped countless businesses to identify opportunities to refine their marketing processes and build their customer base. However, recently the sales funnel has been failing to account for the nuances of the modern purchase decision process. Consumers are more empowered than ever thanks to the social nature of the internet, and the funnel’s one-way nature neglects existing customers’ abilities to give feedback and interact with brands and other potential customers. Last year, McKinzie developed a new marketing model that effectively illustrates the added dynamics of consumer feedback and the socialization of the buying process. They call it the Consumer Decision Journey, and it’s already beginning to pay big dividends to businesses that are embracing it. It’s a bit more complicated than the sales funnel, but it elegantly describes an admittedly complex process involving a variety of forces. Your customers might be more effective than your best salespeople. How are you creating passionate advocates? What are you doing to empower your happy customers? Earlier today, I had the pleasure of watching a fantastic debate between San Francisco writer and self-described "New Media Whore" Paul Carr and Internet wine guru and podcasting pioneer Gary Vaynerchuk of Wine Library TV about the true significance of social media. Regardless of my thoughts on the issue, the video brought up some very good points for and against the importance of social media, both as a business tool and for its impact on society at large. I highly recommend viewing the video at Tech Crunch or YouTube to get involved in the conversation, or below if you're short on time. I think social media is the translation of social interactions into the digital world. You want to share photos with friends so now you share them digitally on facebook. You want to ask a friend a question s you text or facebook them. How fast information travels. A single online video can be watched by half the world at any given time. That's dangerous and very powerful at he same time. 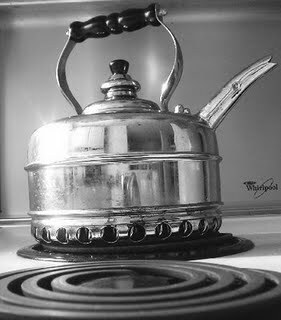 In the end it's a tool like everything else; its how you use it that makes the difference. Kudos to Omar for pointing out just how simple social media really is. While at first glance, that’s pretty obvious, it's also one of the easiest things to forget when addressing social media as a new phenomenon. From a communication technology perspective, this is an unprecedented way to mediate communication on a grand scale. Clearly individuals and organizations haven't made perfect sense of it. That's why we can enjoy great debates such as this and why so many people are cynical about its practical use in business. From a social perspective, however, social media isn't really all that new. People are having the same kinds of interactions they've always had with family, friends, and co-workers. With social media, they're simply doing it online instead of at the dinner table or the water cooler. My point is this. I agree with Paul that social media is being billed as the cure for all marketing ills, and this perception is misleading individuals and organizations every day. But there are too many success stories to discount it's power, and too many people interacting with facebook, twitter and the like to ignore. Would-be entrepreneurs hear stories like Gary Vaynerchuk's and read about average Joe's using social media to realize their dreams, and are inspired to try it themselves. At the end of the day though, it's the individuals with the creativity, smarts, and work ethic who are driving the productive conversations online that should be getting credit for the success stories, not the tools they used to get there. If you're counting on Twitter, LinkedIn or Facebook to create revenue without bringing anything unique or useful to the table, you're doomed to fail. This seems to be the major roadblock for most businesses struggling to make sense of social media. They've heard that hard sell techniques die hard on social media, but they haven't found a way to connect whatever content they do post to a meaningful conversation about their offerings down the road. Success with social happens when a business creates harmony between its unique selling proposition, its brand image, and its content. Social media, when properly implemented, should be a contributing factor to your branding and customer service efforts, not a stand-alone initiative. Simply having a Twitter account won’t bring you business, but as with other marketing channels, the right messages to the right people will. The impact that social media can have on your brand is tremendous. From a business perspective (which seems to be at the heart of this particular debate), social media will help you make money about as much as taking a prospective client out for a juicy steak. Witty banter and delicious food can help establish a connection, but you'll get nowhere if you don't have something unique and valuable to offer. If that prospect decides to partner with you, their decision is not likely because of your impeccable taste in appetizers; it's because you used the meal as an opportunity to create trust in your brand. The personal touch is one of the oldest tricks in the salesman's book for a reason, and social media allows today's marketers to touch more prospects with greater ease. But at the end of the day, its the salesmen, not the channel that will create value for your business. 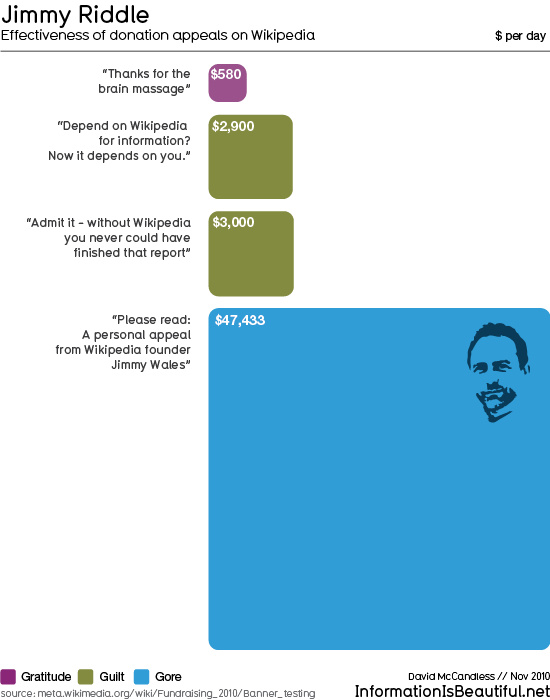 If you surf Wikipedia as much as I do, I'm sure you're familiar with the recent addition of banner ads featuring the face of Wikipedia founder Jimmy Wales and a simple message asking you to please read his personal appeal. I have to say, this campaign is the first that's managed to cut through the noise for me, apparently despite several previous attempts. When I first encountered the banner, I didn't give much thought as to why this particular ad grabbed my attention. Instead, I was immediately engaged by the banner, and clicked through to read the extremely well written letter, just as Wikipedia intended. Since then, Jimmy Wales' concerned mug drew my eye every time I dropped in to read about the egregious pollution in Norilsk, Russia, personality theory, or whatever subject happened to be the fascination of the hour. According to this awesome infographic from InformationIsBeautiful.net (via my one of my favorite tumblogs, TheDailyWhat), I wasn't the only one noticing. The donation numbers speak for themselves. Of course hindsight is 20/20, but I'm not very surprised that a banner ad with a simple message accompanied by a very personal image of Riddle got people's attention better than text banners with pithy messages and guilt trips. As a marketer, you hear every day how important the personal connection with your customers is. The increasing business impact of social media has driven that point home, quite painfully for some. The Wikipedia case shows just how effective that personal connection, established by the banner ad, and intensified by the letter on the landing page can be. Whether you're currently engaged in banner advertising, or considering it as an option, there's a valuable lesson to be learned here. Sometimes you don't need witty ad copy, flashy animation, or high end graphic design to be successful in display advertising. Sometimes, all it takes is the same kind of personal connection that salesmen have been making with prospects since the very birth of business. If you're running out of ideas for your ad campaigns, why not try taking it back to the basics? I just finished my first day of the Internet Summit 2010 in Raleigh, NC and despite it starting a bit later than most conferences (2:30 in the afternoon, perfect for people like me who are a few degrees less than functional first thing in the morning), I've already been impressed by the quality of content, both speakers and vendors represented. While I spent most of my time in the lectures today, I'm definitely looking forward to checking out everything else the Summit has to offer, especially the innovative groups doing demos in the Expo room. Since The Internet Summit has exceeded my expectations for the second year in a row, I thought I'd drop onto the blog to quickly post about some of this year's highlights. In less than 4 hours, I've been able to pick the brains, so to speak, of some of the top minds tackling the bleeding edge opportunities and hottest topics of the Internet today. Not only did we get a thorough and varied look at the best ways to enable mobile users to transact business on the fly from IBM's VP of Emerging Internet Technologies Rod Smith, but we also found out about Red Hat founder and Lulu.com founder and CEO Bob Young's (perhaps foolhardy?) involvement with the Canadian Football League. Some of us were treated to an extremely insightful chat hosted by Jim Tobin of Ignite Media with Microsoft's head of Emergent Media, Marty Taylor Collins on how she chooses where to spend Microsoft's time and money on social engagement, and more importantly, how she's trained her team to focus on ROI from social media, a challenge that it seems every business is facing today. I'm positive that I'll be employing her strategies myself and for clients to help connect social media campaigns to the marketing bottom line. Hearing Discover Channel's Director of Business Development Kurt Merriweather's take on the impact that "cutting the cord" (the increasingly popular tactic of canceling your cable or satellite subscription in favor of streaming all your content online) is having on traditional television content creators was great to hear, especially in contrast to the "party line" that we're used to hearing from the telecoms. As it turns out, television consumption is actually increasing year over year, just not necessarily through the television itself. Thanks to guys like Merriweather, content providers like Discovery Channel are plugging into the viewer trends, and giving them quality content whether they're watching cable, on facebook, their smartphone, or surfing the web. It's great to see that television's content creators are taking steps to stay relevant, even as more and more people choose to consume their shows on their own terms. The Internet Summit supports local beer! I was pleasantly surprised to find the whole spread of Raleigh's very own Big Boss Brewing Company's bottled beers (oh hai alliteration!). As a long time supporter of Big Boss, I can't think of a better way to close out the first day of 2010's Internet Summit than with a cold Hells' Belle Belgian Blonde. I'm really looking forward to learning more at tomorrow's sessions. I'll be sure to update the blog tomorrow with more from the Internet Summit! If you're here too, I'd love to hear your thoughts on today's sessions and some of your biggest insights. A Digital Marketing Manifesto: Have You Been Misled? The most frustrating challenge facing marketing directors today probably isn't how to convince their boss that they need to spend more time and money on digital marketing, although what may seem obvious to you may not be quite so crystal clear to the folks upstairs. It probably isn't figuring out which method of digital marketing can help your business succeed in accomplishing your greater marketing objectives; if your inbox is anything like mine, you’re inundated with a library of information on how search engine optimization, paid advertising (search engine marketing), social media, etc. can benefit your business every day. Not that anyone has the time to digest it all, but once you’ve read enough whitepapers and attended enough webinars, you probably have some solid ideas for how your business stands to benefit from a myriad of digital marketing methods. My hunch is that the biggest challenge facing marketing directors and businesspeople of all kinds today is: knowing where to begin with their digital marketing plan? Indeed, the agencies, consultants, and various service providers do such a splendid job of espousing the benefits of their services that it quickly becomes paralyzing unless you understand how each piece of the marketing puzzle fits together. While there are certainly a few things that every organization marketing on the web should have in place before aggressively seeking traffic online (we’ll go into greater detail on these basics in a later post), it’s important to approach your overall marketing plan from a macro level as well as a micro level. It can be very easy to get lost in the minutiae of the benefits of SEO versus SEM versus blogging and forget that there are many ways that these disciplines overlap, and feed each other. Unfortunately, many marketers with limited experience online make the mistake of focusing their efforts entirely on one or two aspects of digital marketing while neglecting other complimentary or even essential aspects, dooming their plan from the get-go. As digital marketing service providers become better at what they do and more specialized in their respective fields, their advice and marketing messages often become more focused on their one area of expertise, often misleading their clients to believe that their method is the silver bullet for all their digital marketing problems. I’ve even heard well-respected gurus advising their clients to avoid entire pieces of a marketing plan altogether because their web design service is competing with SEM for client dollars. The sad reality is there is no silver bullet in digital marketing, and yet there are people making millions of dollars a year on marketers and business owners who don’t know any better. I’m sad to say that from what I’ve seen, this cottage industry based on ignorance shows no sign of slowing down. There are so many specialists in the market pitching their services, and not enough strategists helping marketers determine how to employ them for long-term success. In this environment, marketers need help developing a comprehensive, holistic marketing plan to increase efficiency of their marketing dollars and grow their organizations the smart way. No two organizations are the same, and I believe that a thorough understanding a client’s needs, strengths, and weaknesses combined with diligent research and marketing creativity can achieve a lot more than one-size-fits all, digital snake oil. My purpose is not to insinuate that all marketing specialists can’t back up their promises. Coming from an agency background myself, I’ve seen firsthand what a relentless focus on your business’ core strengths as opposed to trying to be a jack-of-all-trades can accomplish. My purpose is to help you see how necessary it is to approach your organization’s digital marketing from the big picture so that you don’t put all your eggs in one basket, only to become bitter about its inevitable inability to live up to your expectations. Social media is such a buzz word these days that it can be very easy to discount it as another fad. I'm sure most of us know better than to write social media off, and yet seemingly every few weeks we see another example of a well known brand failing to grasp the impact social media has on their reputation, whether they're actively engaged in it or not. Matthew Yeomans over at Advertising Age recently posted a great slide show with 37 case studies on social media blunders by big brands. It's worth spending a little time thumbing through each of the cases to see some of the ways that the web and social media are forcing industry juggernauts like GM, Boeing, Domino's, and even Facebook itself to take customer feedback seriously. Most notable was how many of the companies Ad Age discusses had little to no social media presence before being raked over the coals by the masses. It's hard to believe that organizations with the budget and resources to take the reigns of the discussion of their brand neglected this very real marketing and PR channel before their respective wake up calls. What was once best practice in public relations just won't cut it in today's connected world. Does your organization have a plan to engage your most vocal customers in a constructive way online? If not, this litany of blown opportunities and costly social media fumbles should scare you straight. Even if your organization is actively engaged in social media already, it's easy for details to fall through the cracks with the pace of digital marketing today. Our Free Digital Marketing Consultations cover social media as well as other aspects of digital marketing like SEO, paid search, and analytics. Why not let us check your work to see if you could be getting a bigger bang for your social media buck? Sign up for your Free Consult Call using the form to the right, or click through to our Free Digital Marketing Consultation page for more information. Let us help you ensure that you don't end up on the next list of social media blunders.